Hey-o, friends in film du C-U! We are very fortunate to announce the tenth issue of our C-U Confidential digest is now in the works for a late springtime berth! We also cross our fingers that we didn’t put off too many of you when our humble editor had to swallow pride and ask for help a few weeks ago to eradicate a small but lingering debt with our long-time press, Premier Print Group of Champaign, before we could move forward. The faithful stepped up with kindness and we made haste to settle the bill. Of course, we now face the prospect of starting from scratch again to fund CUZine #10 and have elected to stick with the normal process for this round. Please click here for current advertising rates and then click here to write us about the ad space we should hold for you! We have to do our damnedest to fill our pages with your product, service, or message within the next two weeks, so please contact us shortly. This immediacy is the second half of what we feel is necessary to restore good faith in Premier as a customer. 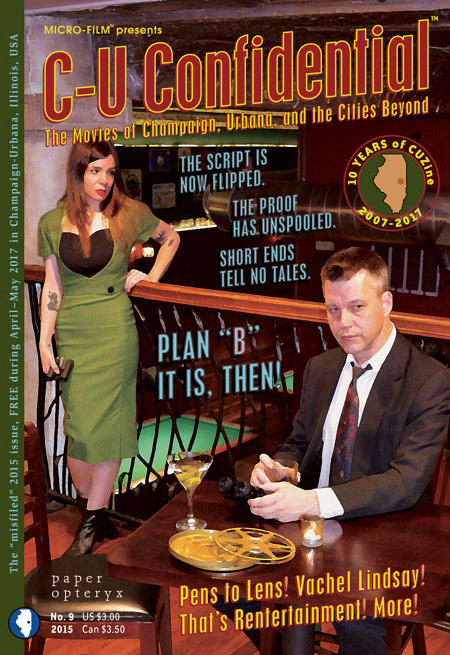 Once CUZine #10 lands in our dearest readers’ hands and intoxicates them with the stories of the movies of Champaign, Urbana, and the cities beyond – that is, if the fresh ink doesn’t bowl you over first! – we will belatedly conclude our first decade in print. We plan to announce in the near future a potential move towards other platforms in which we can offer independent press for independent cinema. We thank again our community for following along and supporting our efforts. p.s. We will also soon reveal the contents of issue 10 in which a century-old movie house, an unheralded student film journal, a secret screening venue, a daredevil stunt team, and dozens of area movie-makers come together under one pulp cover! This entry was posted on Thursday, March 22nd, 2018 at 3:30 pm	and is filed under C-U Confidential, Deadline du C-U, Print Matter du C-U. You can follow any responses to this entry through the RSS 2.0 feed. Both comments and pings are currently closed. 14 distant relations of Jan Tschichold dissected this page in 0.716 seconds while exacting sweet revenge in silence.